Most of us can recall some of our significant milestones in life, those defining moments when we realized that we had finally grown up and became a bona fide adult. Maybe it was landing that first job out of college, getting married, or having a child. For me, it was making my first pot roast. 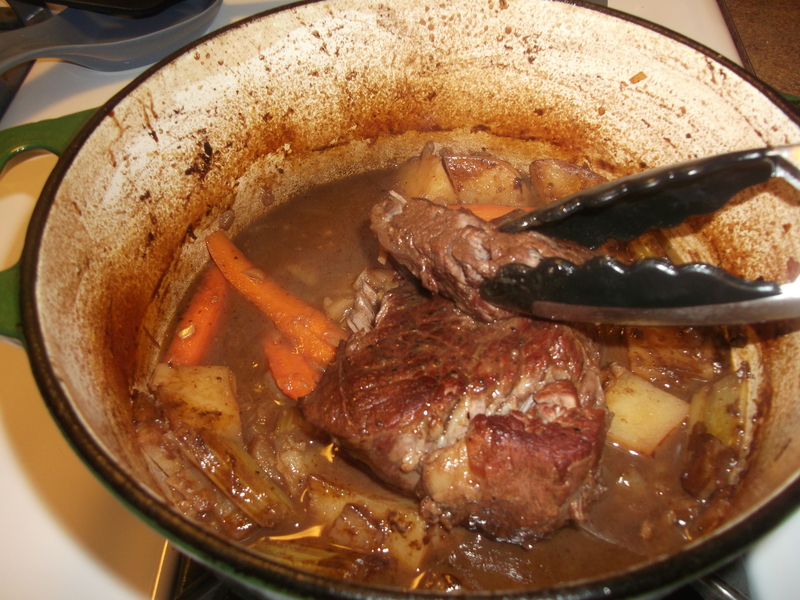 When I was growing up, Sundays were Dad’s day to mess around in the kitchen, and pot roast was one of his specialties. My mom and I would go out to a movie or hit the mall, anything to get out of the house (and out of Dad’s way), and we would return home to a warm kitchen filled with the mouthwatering aromas of beefy deliciousness emanating from the oven. 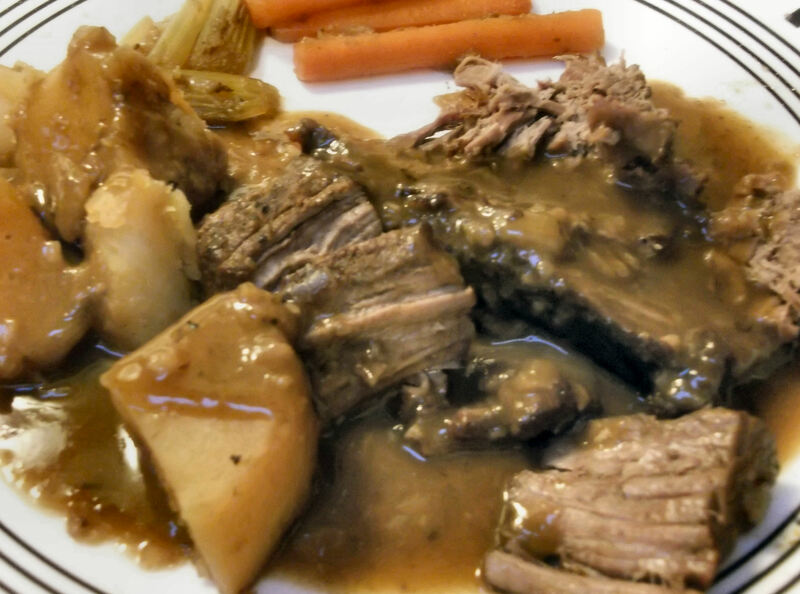 When I made my first pot roast, it turned out pretty good – it even tasted a lot like my dad’s. Over the years I have experimented with my recipe and refined it to the point that I think mine is even better than Dad’s. Really, I think this is the best ever, so I even named it as such. I hope you’ll agree! Preheat oven to 300 degrees F. Trim the largest chunks of fat from the perimeter of the meat and season all sides well with Kosher salt and black pepper. In a large pot or Dutch oven (at least 3½ quart capacity, preferably larger) heat about 1 T of the oil until it shimmers. Sear the meat over high heat, about 5 minutes on each side, until a nice brown color develops. When you can slide the meat freely across the bottom of the pan, it’s ready to turn to another side. If it sticks, it’s not ready to turn. When all the sides are seared, remove the meat and set aside on a large plate or bowl. Add the remaining oil and reduce heat to medium. 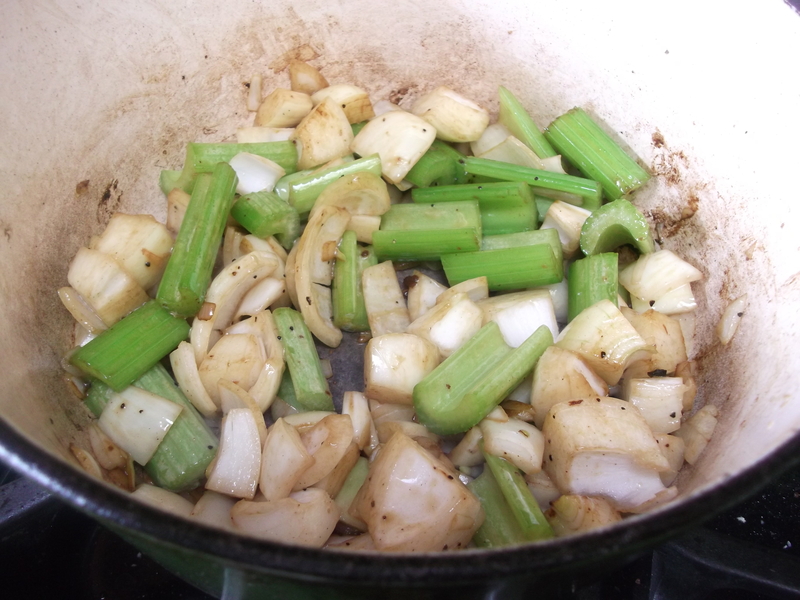 Add the onion and celery and sauté until lightly browned, about 3 to 5 minutes. Then add the garlic, tomato paste and horseradish. Stir for a minute or so, or until it loses its pungency. Add the wine and cook until it has nearly evaporated. 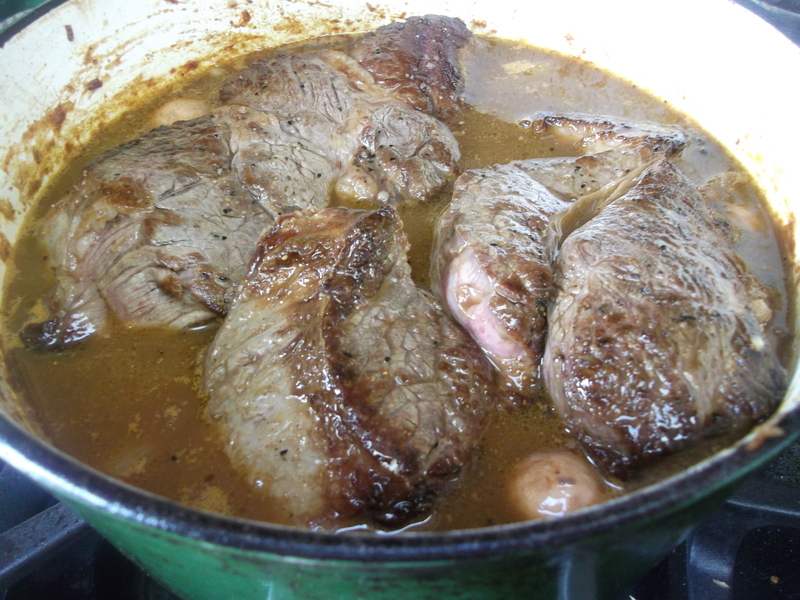 Return the meat and any accumulated juices to the pot, then add just enough beef stock/broth to cover the meat about 75% – do not completely submerge the meat. Reserve any extra stock/broth for later if you don’t need it all; add water if more liquid is needed. 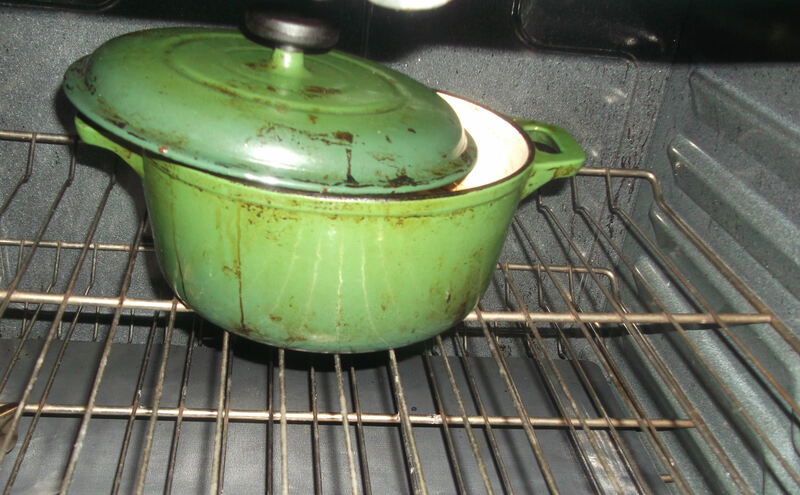 Place the pot in the oven with the lid slightly ajar (leave about an inch uncovered), and cook for four hours total. After the first three hours, add the potatoes and carrots (nestle them under the meat to submerge them; add a little extra water if needed). 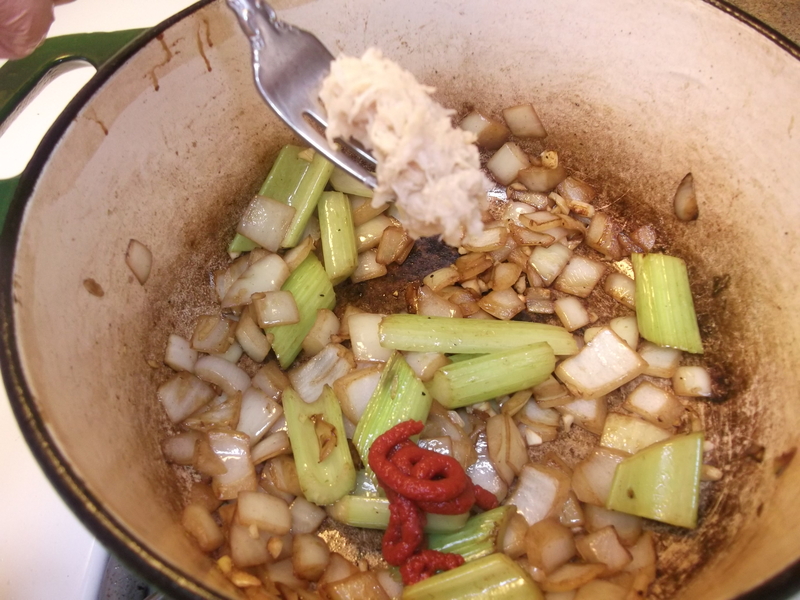 Place the pot with the braising liquid on medium heat (if you have any reserved stock/broth, add it to the pot) and gradually stir in the flour/cold water slurry to thicken and lighten the gravy to the desired consistency. Serve with the same red wine used in the recipe. 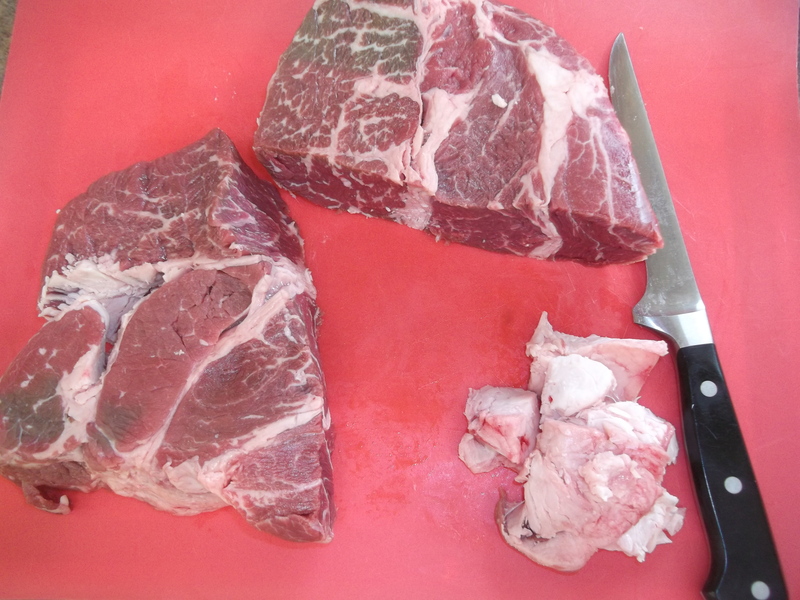 Start by trimming the largest outer chunks of fat from the meat, but be sure to leave some of the fat/marbling: that will cook down and provide lots of flavor. Trimming the fat is optional, as most of it will break down while cooking anyway, but then you’d have to strain it off later if you don’t want really greasy gravy. And by the time this has been cooking all day and filling my house with its delectable aromas, I don’t want to wait to strain anything. I’m ready to dig in! Season both sides well with Kosher salt and pepper. 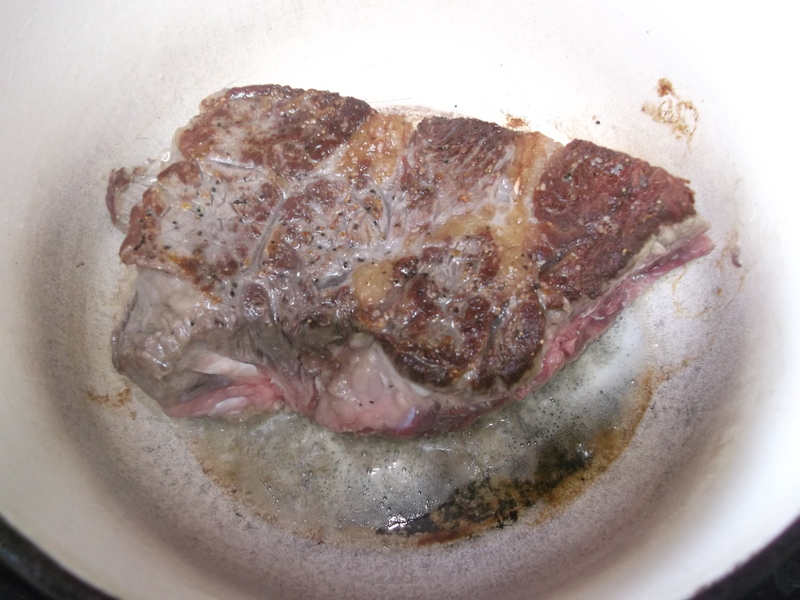 Using Kosher salt will give the meat a nicer browned crust when searing, but if you don’t have it, you can still use regular table salt. In a large pot or Dutch oven, heat about 1 T of the oil over high heat until it shimmers, then add the meat carefully, avoiding splatter, as the oil is VERY hot. Sear the meat about 5 minutes on each side, until a nice brown color develops. Even do the edges, if you can get it to stand up without falling over. 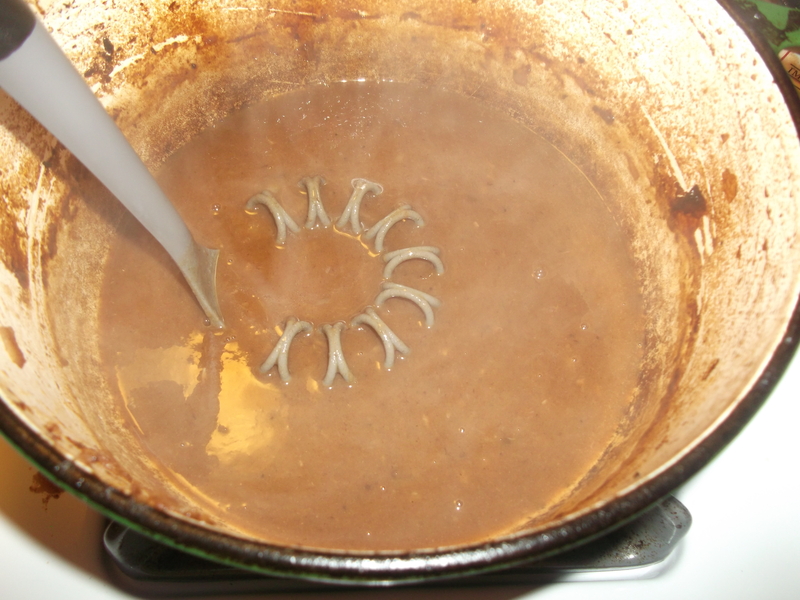 You’ll also get some browning on the bottom of the pot, which will add extra flavor to the gravy, later. When you can move the meat freely across the bottom of the pan, it’s ready to turn to another side. If it sticks, it’s still working on its sear and is not quite ready to be turned. While the meat is searing, it’s a good time to chop the vegetables. Might as well get the other ingredients ready now, too. Wine: use a dry red wine, nothing too fruity, and not something that’s “just for cooking” that you wouldn’t otherwise drink. If you wouldn’t drink it, don’t cook with it. It doesn’t need to be high priced, it just has to have a flavor you like. (I like to use Cabernet, Tempranillo, Nero d’Avola or other drier reds.) Feel free to pour it into a fancy wine glass, too, if you want. I got this Riedel wine glass as a gift, so thought I’d spiff up my blog post by using it here. Horseradish: Yes, really. This is an amazing addition to the flavor. Grated horseradish root lasts pretty much forever in the fridge or freezer (put it in a container and top it off with white vinegar to keep it fresh and prevent it from turning green). I thought to add it to the pot roast since it pairs so well with beef. Even if you can’t stand horseradish, by the time it cooks for hours it mellows and simply adds an extra depth to the flavor: you won’t even notice it. I promise. It will not taste anything like it does in its raw form. And if you do love it raw, serve it on the side with the cooked roast. Most grocery stores sell horseradish root; simply peel and grate it finely, using a microplane grater or the smallest holes on a box grater, just prior to use. If it is exposed to air too long, it will turn green, but that won’t affect the flavor at all. 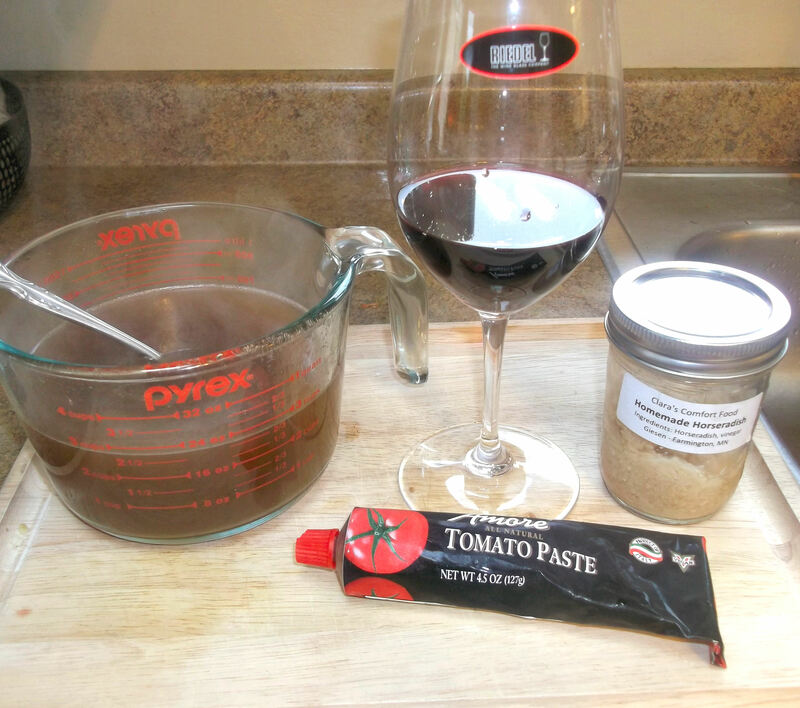 Tomato paste: I started adding tomato paste after a Cook’s Illustrated magazine recipe suggested using it in Beef Stroganoff. I can’t remember why they added it there, other than for some extra complexity and umami richness, but it really worked. And it works great here, too. 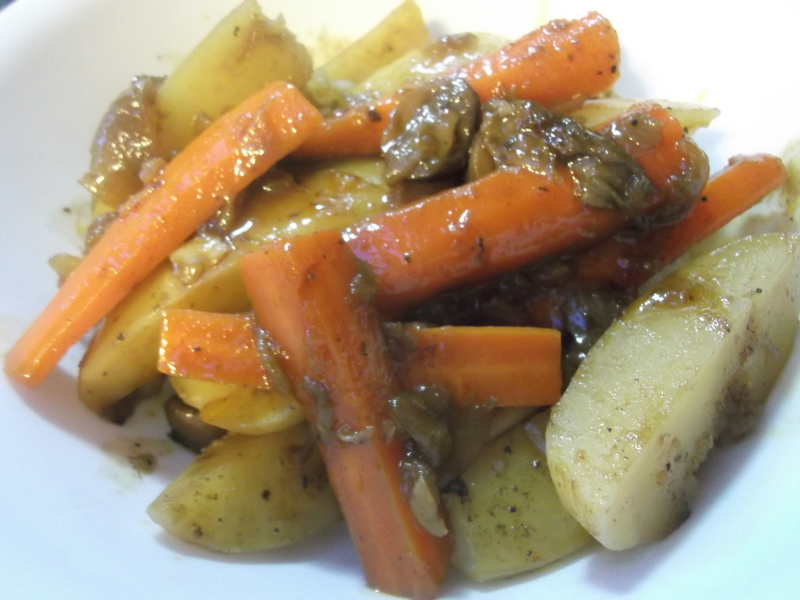 Let’s get back to our pot roast. When both sides of the meat are nicely browned, remove and set aside. Add the remaining oil to the pot and reduce heat to medium. 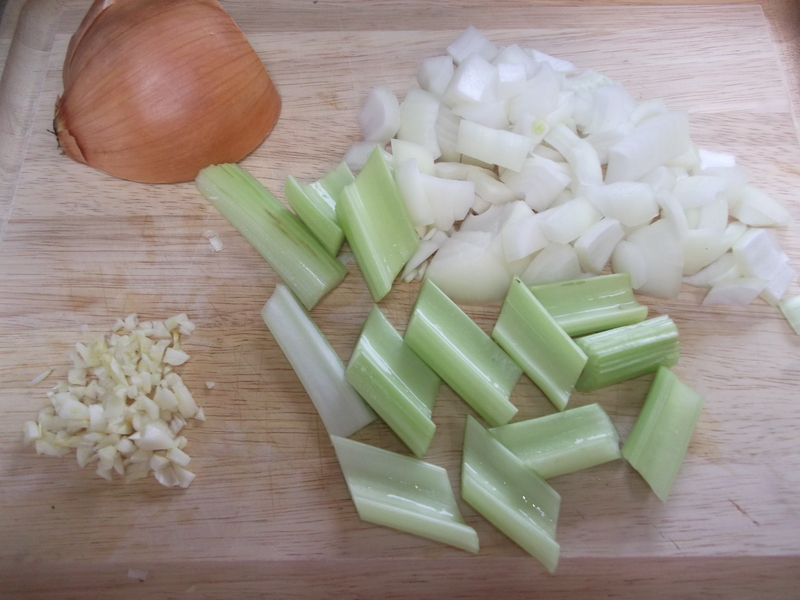 Add the onion and celery, and sauté until lightly browned. Add the garlic, tomato paste and horseradish. Return the meat, along with any accumulated juices, to the pot, and then pour in just enough stock/broth to cover about 75% of the meat. Don’t completely submerge it. The best analogy I’ve heard is to think about crocodiles swimming in a river: the tops of their heads are always visible. Do the same with the pot roast. Give it a good stir and then place the pot in the oven, covered almost completely (all but about an inch). Leaving this opening will keep its temperature lower, to cook the meat low and slow, like we want. Completely covering the pot traps in heat and raises the inside temperature, which will cook the meat faster, making it tougher. So there’s today’s science lesson! Cook for 4 hours at 300 degrees. After 3 hours, add the potatoes and carrots, and add a little water to just cover them, if needed. It helps to kind of nestle them under the meat, so they stay submerged. When the pot roast is done, the meat will be fork tender and the potatoes and carrots will gently break apart with a fork. Remove the meat and vegetables and set them aside in serving bowls/platters. Tent with foil to keep warm, or don’t. Dinner’s almost ready anyway. Place the pot of liquid on the stove over medium heat. An optional step is to remove some of the fat from the remaining liquid by pouring it into a fat separator, but I’ll leave that up to you. I usually don’t bother. In a 1 C measuring cup, stir a couple teaspoons of flour into enough cold water to make about ¾ C of a slurry. Be sure to use cold water; if you use warm or hot water you’ll end up with tiny clumps of flour dumplings, which is not going to work. 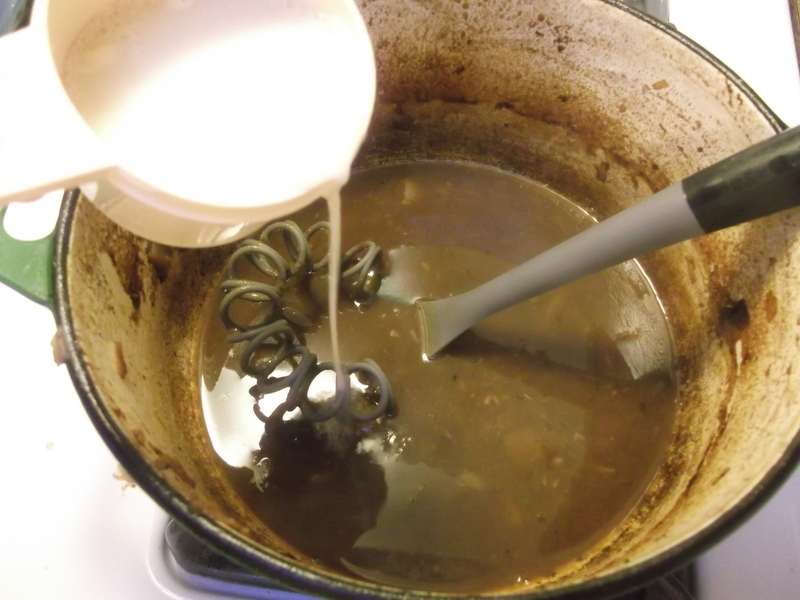 Stir well with a fork to remove any clumps, then gradually whisk it in to the beef liquid thicken and lighten the gravy to the desired consistency. Just add a little at a time, stirring it well, and allowing it time to thicken. When it’s the right color/consistency, season with salt and pepper to taste. If it’s too salty already, dilute with some hot water and re-thicken it with more flour/water mixture. What a perfect meal for this weekend. Just reading the recipe warmed me up–and made me hungry. MMm … the horseradish is a great addition! That looks soo good. Thanks for the recipe. I will have to try horseradish. 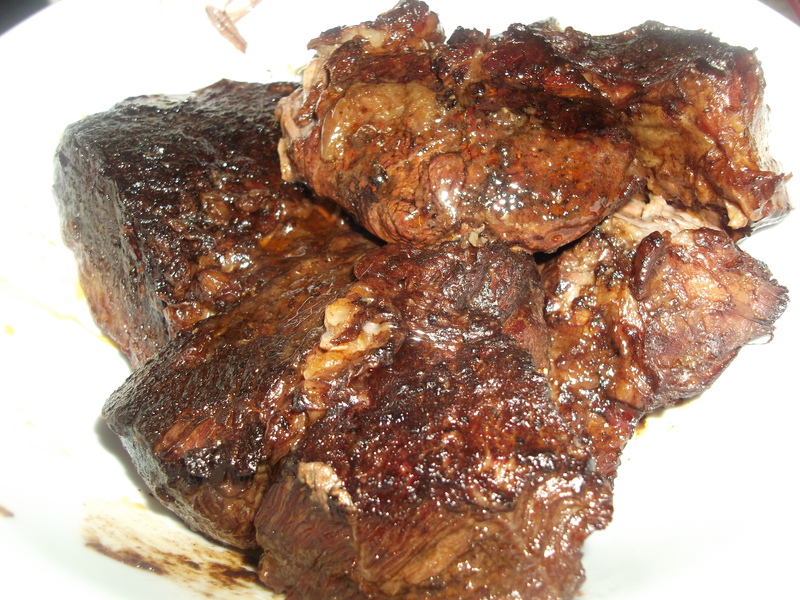 Im doing a chuck roast this weekend and will try the horseradish. 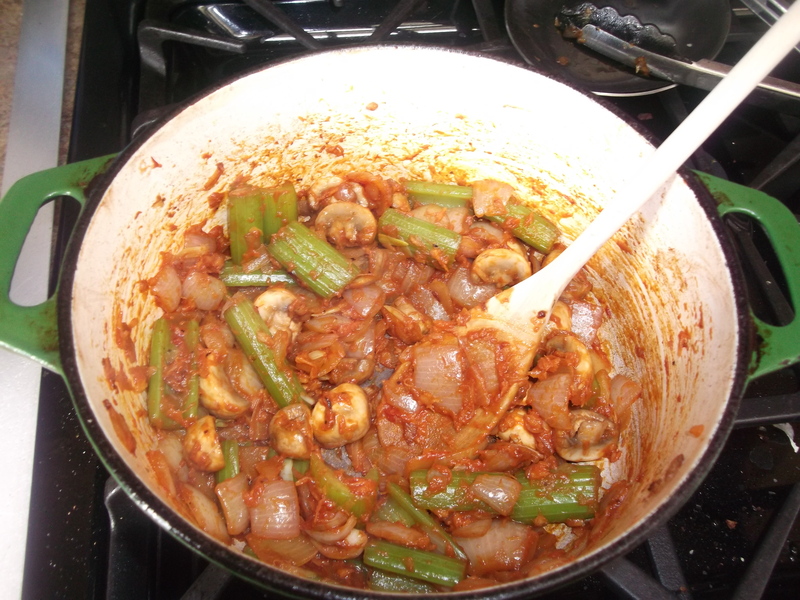 Sometime I will put some whole mushrooms in with veggies. You have some nice recipes. Thanks, Tom! I hope you love the horseradish with the roast. Whole mushrooms sound really good, too, for some extra texture and flavor.